I'd known of Red Spice Road in QV for a while but hadn't eaten there until a recent visit with some colleagues from work. Inside and out the look is clean and modern with a few Asian influenced touches. It is glazed on three sides, allowing plenty of light in and views out across the city. 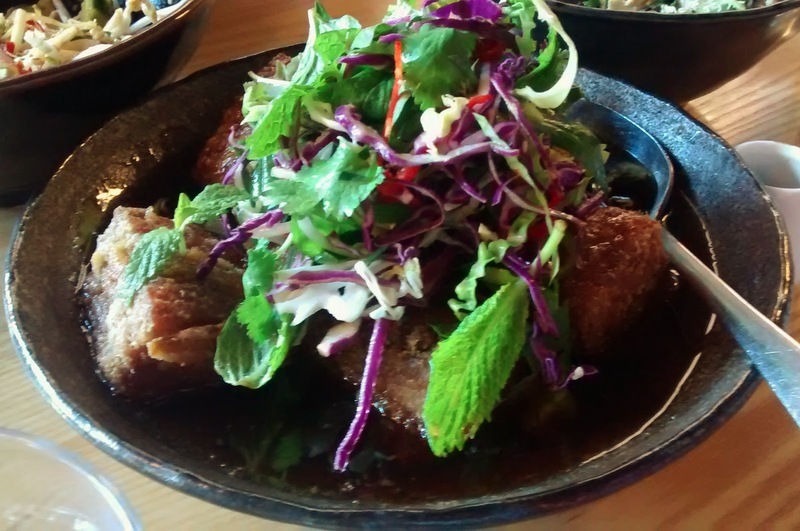 We shared the five dish express lunch menu, which comes in at $36 a head. A couple of us went with the veggie option, which meat we got a slightly different selection. Our entree was a spicy broad bean fritter which was softer than expected but given loads of kick by the chilli jam. The other appetiser was betel leaf topped with shredded pork, chilli, lemongrass and coriander, which looked elegant and light. 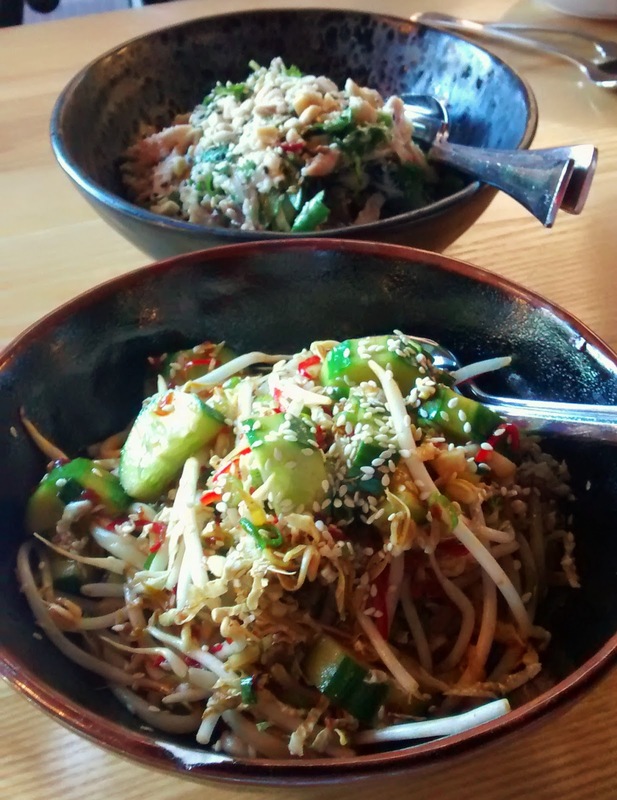 The first two of the main dishes to arrive were the hot and sour Szechuan noodle salad including Shanghai noodles with cucumber, shredded cabbage, green onion and pickled ginger and the shredded chicken, pennywort, herb, peanut and coconut salad. 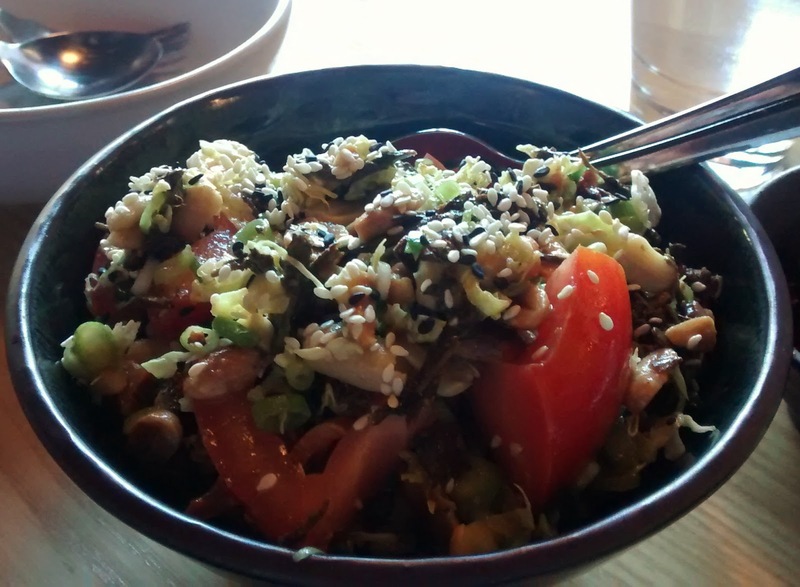 I tried the noodle salad which was packed with flavours. The tea leaf salad was another of the veggie dishes, I've since found out that it is a speciality of Burma and flavour of the fermented or pickled leaves is distinctive and unlike almost anything with perhaps a hint of blue cheese about it! 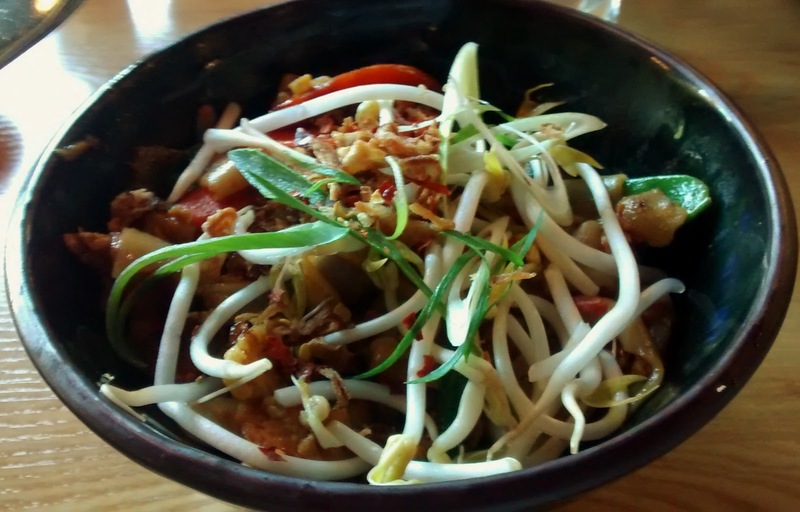 The stir fried noodles with tofu had a great pad Thai vibe to them. The corn fritters were firmer and crunchier than the entree. I tried a little of the southern Thai fish curry with sweet potato which was nice enough, with plenty of mellow turmeric and coconut milk, but lacked a bit chilli punch. I also had some of the Char kway teow, and the fat rice noodles with prawns, lup cheong, soy, chilli, egg and bean sprouts were good. The service throughout the meal was well paced, friendly and accommodating of our group of around ten. The dishes were all good with a few standouts, in fact they probably tempted most of us to overindulge leaving us feeling full all afternoon. Next time I'll stick with the 3 dish banquet option!